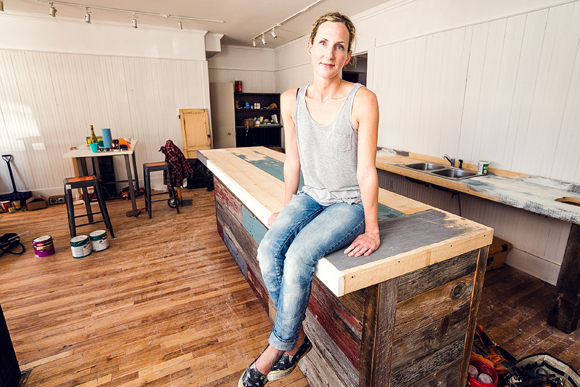 Crystal Beshara has created a new space for workshops and art exhibitions. Photo by Ted Simpson. Award winning painter and international art teacher Crystal Beshara has built a new hub for Ottawa’s artistic community to meet, create and learn in Hintonburg. The Studio Café at 1089 Somerset Street is a new art gallery with the casual atmosphere of a coffee shop. Beshara created the space to give art creators and admirers a place where they can attend workshops, exhibitions, rent studio space or just enjoy a locally roasted coffee in good company. Beshara has spent the past decade as a self-employed art teacher, partnering locally with Algonquin College and the City of Ottawa, as well as travelling the world to share her workshops. The Studio Cafe serves as a teaching space for her and the roster of local art professionals she has enlisted to offer classes on every aspect of visual art. “I hand picked all my favourite art instructors in the city who offer classes in mediums that are different from what I teach,” says Beshara. She has been hard at work getting the space ready to launch on May 3. The large, open interior has workshop and studio space in the back with the cafe and gallery up front. The cafe features accents from gritty, reclaimed wood and antique doors, “I grew up on a farm so that esthetic is tightly honed, this is really an extension of my farm house life,” said Beshara, who’s rural roots take her back to St. Isidore. The workshops at The Studio Café are not just for the serious artist either. Beshara has a range of workshops lined up for the summer that cater to teenagers in the 13- to 17- year-old range that include hand-drawn film animation and film making 101 for DSLR video. “A lot of art classes are geared either towards adults or kids and there is nothing really cool for teens, because they don’t want to do crafts and cartoons,” says Beshara. Information about workshops, summer camps, and reserving studio space can be found at thestudiocafe.ca.